Out today – the second in a series of reports from The Open University that provide a straightforward introduction to innovations in education and look at the implications of these innovations for the theory and practice of teaching, learning and assessment. 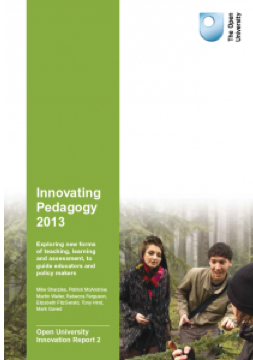 This second report, Innovating Pedagogy 2013, revisits four subjects covered in last year’s report – MOOCs, badges to accredit learning, learning analytics and seamless learning – and highlights six new pedagogies. Crowd learning harnesses the local knowledge of many people to answer questions or address immediate problems. Digital scholarship enhances scholarly practice through networked technologies. Geo-learning uses the location detection of smartphones to provide context-based learning materials. Learning from gaming exploits the power of digital games for education. Maker culture describes the informal networks of people who share practical learning, motivated by fun and self-fulfilment. Citizen inquiry fuses the creative knowledge building of inquiry-based learning with the mass civic engagement of volunteer activism. new pedagogies that might transform education. The report was written up in the Times Higher Education on 3 October 2013. This entry was posted on September 9, 2013, 3:07 pm and is filed under Analytics, Educational Futures, Publications, Reports. You can follow any responses to this entry through RSS 2.0. You can leave a response, or trackback from your own site. Sun Hongfei from the Open University of China (OUC) translated the report into Chinese in 2014.